No matter what your size you need to have solid governance practices. It is often said that the character of an organisation is reflected frim the ‘tone at the top’. The recent problems of the NSW RSL illustrate the decay and eventual disaster that can result from poor governance and loose controls. With charities and FPO’s (For Purpose Organisations) increasingly under the media spotlight they more than ever need to have governance and controls at the forefront of their thinking. Why? Reputation risk is clearly a major consideration and once this slips in the public eye the organisation WILL suffer. Once the snowball of negative reputation gains momentum this can turn into an avalanche and in turn an increase in earnings risk as a function of fundraising and then the question of sustainability becomes a realistic issue. With the operating framework for charities and FPO’s becoming increasingly complex together with what I see is now the dawn of a new regulatory era with the ACNC, not to mention increased media scrutiny highlighting unscrupulous practices, it is crucial that the sector is both adept and effective with respect to its governance and control practices. The relatively recent focus of the AICD on FPO Board responsibilities is welcomed and is providing a brilliant education piece for the sector – but how is it performing, really? From what I have seen the sector is improving in leaps and bounds but still has quite a way to go with many cultural challenges ahead. A key element is process and accountability. Once these foundations are in place significant improvements usually follow quickly. And what process you may ask? The answer to this is to design accountability within the process between management and board –the anecdote that ‘what gets measured gets done’ may be simple but is a fundamental accountability piece and in turn governance practice no matter what size and industry the entity operates. On a base level this involves a structured responsibility and task checklist. 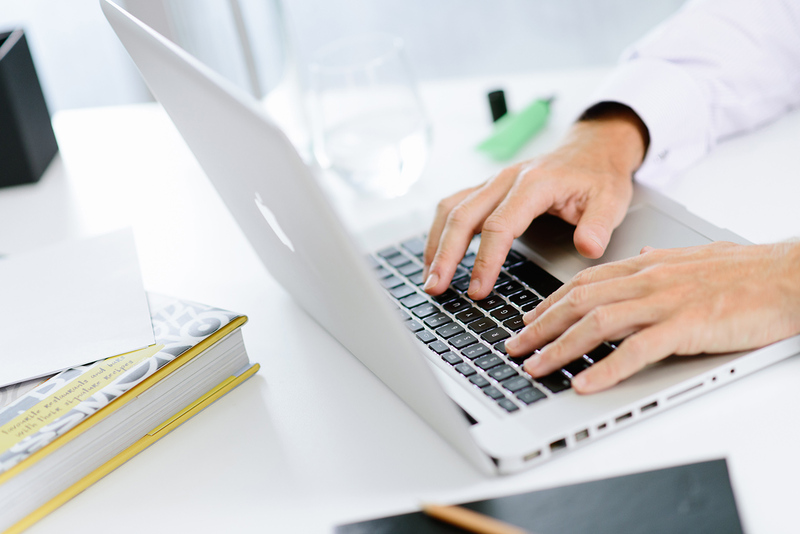 At a more complex level this takes on features such as detailed meeting minutes with action points, agreed key performance metrics, employee and management attestations, lodgement calendars together with periodic reporting to name a few. A very useful tool is a lodgement calendar. As the list of required lodgements is increasing so does the risk of a missed lodgement. 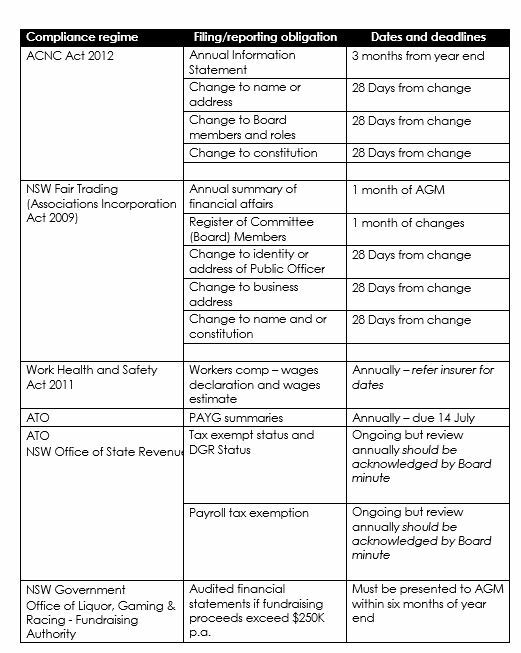 Below is useful key lodgements checklist (by authority) based on a large* charity. Note this is not intended to be the complete list but that of key lodgements. I would suggest you can adopt and expand to this list as appropriate. Another key decision of a charity/FPO is the choice of financial statements – whether it be a general purpose or special purpose. There is quite a deal to consider with this and as such this will discussed in the next blog issue. Note the term FPO is used where commonly the term NFP is used – refer my blog ‘Does the term NFP infer a loss is OK?